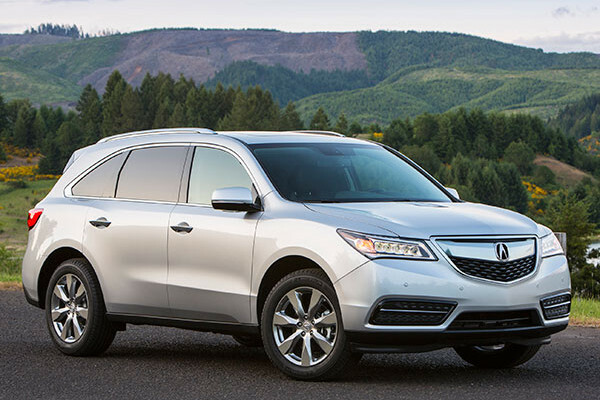 The Acura MDX has been further refined for 2016 following a complete redesign for the 2014 model year. The 2016 Acura MDX gets a new nine-speed automatic transmission with a push-button gear selector that frees up interior space. Meanwhile, a new twin-clutch SH-AWD all-wheel-drive system has been made available to 2016 MDX models. New safety features and more technology, including Siri Eyes Free voice recognition are available. Inside are new refinements, including a driver’s seat that moves rearward when the door is opened making it easier for driver entry and exit. MDX is a premium midsize SUV in the same class as the Lexus RX, Volvo XC90, Buick Enclave, BMW X5, Audi Q7, Infiniti QX60, and Mercedes-Benz ML-Class. Acura first introduced the MDX in 2001 and it is now on its third generation. MDX seats seven, with three rows. All models use a 3.5-liter V6 rated at 290 horsepower. Front-wheel drive is standard and all-wheel drive is optional. MDX looks sharp and offers sharp handling and quick acceleration performance. The new nine-speed automatic allows quicker acceleration than did the previous six-speed automatic. Luxurious and enjoyable to drive, with a versatile interior, MDX has a proven record for being reliable and holding its value well. EPA-estimated fuel mileage is 19/27/22 mpg City/Highway/Combined with front wheel drive, or 18/26/21 mpg with all-wheel drive. A Stop/Start feature comes on upper-level models that lowers the EPA City ratings by 1 mpg. Acura recommends Premium gas. The Super Handling All-Wheel Drive system works well for wintry conditions. The 2016 MDX SH-AWD features a new twin-clutch rear differential that directs power between the front and rear wheels and also between the left and right rear wheels. SH-AWD improves handling stability. We found the new nine-speed worked well most of the time, but it sometimes hesitated before selecting a gear, for example going from steady throttle on an on-ramp to acceleration for getting onto the highway. Handling is responsive in Sport mode, but Sport and Normal are uncomfortably firm on beat-up streets; Comfort mode is better on broken pavement. The MDX is quiet underway. The interior is roomy and comfortable and controls are intuitive and easy to operate. The front seats are comfortable and luxurious, and ingress and egress are easy. The 2016 MDX gets a revised driver seat that moves to the rear when the driver door is opened, making entry and exit easy. Pricing for the 2016 Acura MDX starts at $44,865 MSRP and can go up to $57,080; that does not include the $920 destination charge. Leather-trimmed upholstery comes standard; upgraded leather is part of the Advance package. All use a 3.5-liter V6 with nine-speed automatic. Front-wheel drive is standard; SH-AWD all-wheel drive is optional. The looks of the Acura MDX have not changed since the third-generation version was launched for 2014. The MDX nose looks like a beak, drawing in some mixed reviews. The profile and the rear are undistinguished, resembling those of other midsize SUVs. The MDX interior is straightforward and easy to operate has the feel of a premium SUV. The front seats are comfortable. 2016 brought an intuitive push-button transmission shifter which frees up some space. The shift buttons are distinctive from each other in both appearance and feel but are easy to use. The parking brake is a foot brake where you’d have to push down to engage and push again to disengage. The center stack has a chrome surround that can reflect sunlight at certain angles. 2016 models get a new, slim frameless rearview mirror that’s unobtrusive. The second row moves forward or rearward for greater room for third-row passengers or second-row passengers. Pressing a switch allows easier ingress and egress to the third row seats. Squeezing into the third row is still a bit difficult, however, suitable only for children. Cubby storage is superior to most European SUVs. The center console has a deep bin. Next to the center console and just above is a small tray for smartphones or other small items. Cup holders are straightforward and positioned well. Ahead of those is a small bin for keys with a power receptacle. MDX offers nearly 91 cubic feet of cargo space with the two rear rows of seats folded, significantly more than that of the 2015 Lexus RX, with its 80 cubic feet. An underfloor storage area is provided. The third row folds by pulling a lever to mechanically flip them down. The third row folds flat but leaves small holes in the corners that may need to be stuffed with rags if you have a dog. The second row splits 60/40 and folds independently almost completely flat however, there are lots of gaps and holes. Acura MDX is powered by a direct-injected 3.5-liter V-6 engine producing 290 horsepower. It’s connected to a nine-speed automatic in all versions of the MDX, and that transmission can be paddle-shifted from the steering wheel. We found the suspension to be quite firm in Normal mode on rough urban and suburban streets with pot holes. Pressing the IDS button on the center console switches the Integrated Dynamic System through Normal, Sport, and Comfort, adjusting the damping of the shock absorbers. The Comfort setting makes those rough roads feel much smoother. Sport works best on smooth, winding roads. The MDX is easy to drive. The steering doesn’t transmit feedback to the driver, but when driven hard, the vehicle feels capable and coordinated. Pressing the Drive/Sport (D/S) button on the transmission selector alters shift mapping between Sport and Drive. Using the paddle shifters when in Sport mode evokes quick upshifts and blips the throttle for aggressive downshifts. Pressing the Drive/Sport (D/S) button on the transmission selector alters shift mapping between Sport and Drive. Overall, it works well, but the nine-speed has lots of ratios to choose from and can sometimes get confused by it all. The car will automatically shift itself into Park when pulling into a parking spot and switching off the engine, which is a nice feature to have. Super-Handling All-Wheel Drive (SH-AWD) makes the MDX a great vehicle in wintry conditions. The Super Handling part improves handling stability by turning the wheels with the best grip. The Acura MDX has always been a standout product in this class and continues to be. It’s a relatively sporty vehicle, fun to drive, but the ride can be uncomfortably firm on rough roads.